This set of Control Systems Questions and Answers for Experienced people focuses on “Time Response of Second Order Systems – III”. 1. The unit impulse response of a second order system is 1/6e-0.8tsin(0.6t). Then the natural frequency and damping ratio of the system are respectively. 2. In a RLC series circuit, if the resistance R and inductance L are kept constant but capacitance C is decreased, then which one of the following statements is/are correct? 1. Time constant of the circuit is changed. 4. Maximum overshoot is unaffected. As C decreases, time constant remains unaffected. If the system shown in the above diagram x (t) = sint. What will be the response y (t) in the steady state? Explanation: Gain of the closed loop system is inversely proportional to the damping and hence if the gain of the system is increased then the damping is reduced and becomes less than 1 system becomes undamped . w = 4 and K = 16. 6. Assertion (A): It is desirable that the transient response be sufficiently fast and sufficiently damped. Reason (R): Oscillations are not tolerated in the transient response. Explanation: Oscillations must not be present in the transient response as it makes the response slow and sluggish and with positive feedback oscillations are increased and hence positive feedback is not used frequently. 7. The maximum overshoot and rise time conflict with each other. Explanation: For the system to be stable the rise time must be less so that the speed of response is increased and maximum peak overshoot should also be less. Explanation: It is given time domain specification and system is desirable with small overshoot and it occurs at first over shoot. Explanation: Compare the equation with the characteristic equation s2+2Gws+w2. Then the value of w = 4 and value of G = 1 hence the system is critically damped with poles on the imaginary axis. 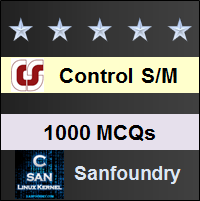 To practice all areas of Control Systems for Experienced people, here is complete set of 1000+ Multiple Choice Questions and Answers.